The Dome Fort is my latest castle design. 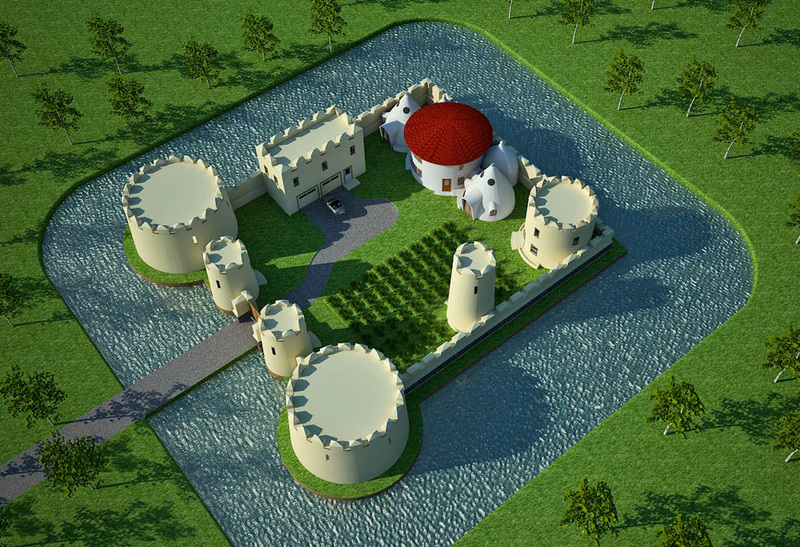 At 100’ x 112’, the 10’ high by 3’ thick (at the base) fortified walls enclose 9,964 square feet. The Dome Fort showcases individual designs and combines them into a self sustaining, fortified homestead, where a group of 5-20 people could weather economic and social upheaval. This is a concept drawing that does not show every possible type of defense. Custom designs can be created to meet your needs. I’ll be glad to discuss all details, including the below grade structures (not shown), with serious clients who hire me at my hourly consulting fee. All plans can be modified for a modest fee. Send inquires to: strawhouses [at] yahoo.com. These fortresses are very cool, but I see a weak point. The gates are the place where there is no moat, and gates itself is weaker than the wall. So the gates can be easily rammed by some vehicle. The same was true to ancient fortresses and medieval castles so they had structures for additional entrance protection like gatehouse and barbakan. It would be a pity to invest into such cool walls but still have the entrance vulnerable. You missed this part that said “This is a concept drawing that does not show every possible type of defense.” It’s too much work to show drawbridges, etc. This is just incredible! The fact that it can be made by a hand full of people in a short space of time puts this within the reach of almost everyone. Well actually, earthbag building is labor intensive. Building something this large would be a huge effort. You’d want to mechanize the process as much as possible and have lots of help. Excavate the soil from the moat to build the walls! Stock the moat with Talapia! Any estimate for what this design would cost to build? Costs vary widely from one place to another, so you’ll have to do a detailed cost estimate. Search our Earthbag Building blog using keywords “cost”, “estimate”, “how many bags”, etc. Wow whata agreat design. when i was a kid i dreamed of living like a castle like this. the feeling of being the king of your whole place is a peculiar feeling,. isn’t it. on July 9, 2012 at 2:26 am Daniel B. Sure. I’m just showing a few possibilities. You could change things around as you like. What an incredible site you have here. I live in south Louisiana, and I’m curious about how well structures like these would hold up under our frequent rains. I know elsewhere on the site you recommend 4’+ roof overhangs for rainy areas in order to protect the walls. How would the exposed exterior walls of a structure like this hold up in rainy areas, or is this particular design not recommended for wet/humid climates? Sometimes you have to modify the plan to fit your climate. I recommend 4′ overhangs or wrap around porches in rainy climates. Most every plan can be modified to fit most needs. How much weight can the roof hold? Correctly built domes — earthbags, concrete, etc. — can support enormous weights. We put about 25 truckloads of soil on our dome and it didn’t budge. Assuming the tamped earth in the bags remains dry, I believe we could put another 25 truckloads on top and it still wouldn’t budge. How detailed are the floor plans if you by one. They’re basic plans — just enough info to build from. They include a floorplan, two elevations, wall section, perspective drawing, sometimes other drawings as needed and a free copy of my earthbag ebook. Full blown plans to meet code can cost thousands from architects and engineers. I’m offering a low cost alternative primarily geared toward low codes and non-code areas. This is the plan I intend to use for the Garden of the Olympians – just enlarged and altered a bit. Isn’t it amazing?? I’ve have always wanted to build my own Earthbag home, but I’ve never attempted as I live in Nebraska and I didn’t know if it would be able to survive a winter here. I would like to ask your opinion on weather it would last or not. what would you suggest for Alabama? Use plans with roofs, wide roof overhangs, open layouts with good ventilation, white roofs, etc. Search my name (Geiger) plus “Passive Cooling Strategies” to find two of my blog posts that describe dozens of low cost simple solutions for beating the heat. I live in the Philippines and I sent you an email under strawhouses (at) yahoo.com as I am VERY interested in this design. I plan to start a homestead with my wife there on a very large piece of land and THIS is exactly what I need. My question is how do you keep the moat clean and mosquito free? As shown on the first page of this blog and top of the page at Natural Building Blog my email now is natural houses [at] gmail.com. There are special fish for controlling algae, etc. One kind is called ‘algae eaters’. You’ll have to research this more since I’m not a fish expert. Also, there are mosquito eating fish. This is common in Thailand. There are thousands of clay pots with mosquito larva eating fish throughout the cities. It’s easy to cut CEBs with a masonry saw to make those slits. Are these castle plans available for purchase? This is almost exactly what I want. I need a 1750 sf minimum conditioned space and attached garage. My property is in N Florida but this would be built in a heavily shaded area. Are the flat roofs slightly slanted for rainfall? What are the top roof edges (parapets?) made of? There is another of your earthbag houses (round house cluster) going up less than 30 miles away. Fully permitted. Yes to everything. Email me at natural houses [AT] gmail.com for details. You can build the parapets (= short wall around the roof edges) however you want. Most people would use conventional building techniques using wood framing. In Florida, these would have to withstand hurricane winds. That means you’ll need professional advice from someone in Florida who knows the local codes and building practices. Life finally went my way, and I can (more than) afford something like this. I’d like to do something pentagonal, and one structure at at time. Significant concrete stabilization. Walls taller and thicker… Walkway on the walls. Towers at the corners. 4 stories. Cistern… You using cryptocurrency yet? My assistant Zafra handles orders by email or phone. She can process orders in more ways than Dream Green Homes. Her contact info is on this page here: http://www.naturalbuildingblog.com/owens-book-dvd/ (scroll down then contact her directly). You’ll be better off with the original CAD source files so you can customize the plans.